Killer of Go - Technique and Preventative Measures was a famous book by Sakata Eio. It was translated into English by Bob Terry. Killer of Go was originally published in Japanese in 1967 by Ikeda Shoten (池田書店) under the title of Go no Koroshi-ya (碁の殺し屋). It was published in English by Yutopian Enterprises in 1994. While this book is currently out of print, it is available in digital format from SmartGo Books. BillSpight: The Killer of Go series of books is aimed at kyu players. (Vol. 1: Go Killer, vol. 2: Tesuji, vol. 3: Fuseki, vol. 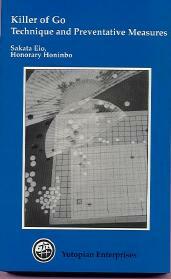 4: Joseki, vol. 5: Tsumego and Yose.) Maybe someday the whole series will be translated. :-) I haven't seen it, but maybe vol. 2 is the "Tesuji and Anti-suji" book. Chapter 1. Two paths to a winning game (pp 11 - 78) Ten examples from professional or old master's games, where large groups get killed. Chapter 2. "Killing Stones": pluses and minuses (pp 79 - 108) Three good advices for the middle game and three examples of misfired attacks. Chapter 4. Killing techniques (169 - 206) How to develop your reading strength. Examples of reading mistakes or exquisite reading from pro games. Ten advices about fighting. Chapter 5. Killer of Go - preventative measures (209 - 219) Caution - sacrifice a.o. This page has been WikiMasterEdit-ed by DieterVerhofstadt. Some of the discussions can be found at the ZokuSuji page.